Detailed overview for the CH-53K King Stallion. CH-53A/D USMC utility transport role. Nickname Sea Stallion. RH-53A/D USN airborne minesweeping role. Nickname Sea Stallion. HH-53B/C USAF combat search and rescue (CSAR) role. Nickname Super Jolly Green Giant. CH-53C USAF general transport role. HH/MH-53H/J/M USAF Combat Search and rescue (CSAR) role. Nickname Pave Low I,II,III,IV. CH-53G/GS/GE/GA German Air Force transport role. License build CH-53D. S-65C-3 Israeli Air Force transport role. Upgraded and designated: Yas’ur 2000 / Yas’ur 2025. CH-53E USMC heavy lift transport role. Nickname Super Stallion. MH-53E USN airborne minesweeping role. Nickname Sea Dragon. CH-53K To be operated the USMC in the heavy lift transport role. Nickname King Stallion. Sold its two helicopters to Israel. Germany ordered 112 CH-53Gs which is based on the CH-53D model. 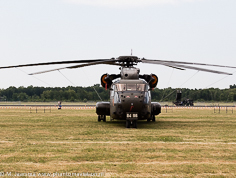 The first two helicopters were produced by Sikorsky with the first delivered on July 26, 1972. The company also produced 20 kits for the next helicopters which were assembled in Germany with the remaining 90 being build in Germany. 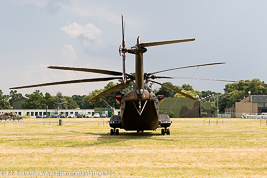 In 2013 the CH-53 fleet was transferred from the German Army (HEER) to the German Air Force (Luftwaffe) with all helicopters assigned to Hubschraubergeschwader 64 (HSG 64 - Helicopter squadron 64). It's current fleet of CH-53s helicopters need to be replaced. Both the CH-53K currently in the test an evaluation phase for the USMC as well as the CH-47F Chinook are candidates to replace the current helicopters. Currently 66 CH-53s should be operational (40 CH-53GA and 26 CH-53G/CH-53GS). Airbus helicopters received a contract to upgrade 26 Stallions on February 27, 2017. The contract covers the retrofit of 26 helicopters which will keep them operational until at least 2030. Airbus helicopter plant Donauworth (Bavaria) will complete the work which will start in 2017 and be completed by 2022. The retrofit covers the replacement of obsolete parts being replaced by up-to-date components. The original version delivered to Germany based on the US CH-53D model. It was taken on strenght by the German Army and classified as Medium Transport Helicopter (MTH). .
Based on the first experiences with the helicopter made in international operations by 2002 the CH-53GS was developed and 20 helicopters received an upgrade. 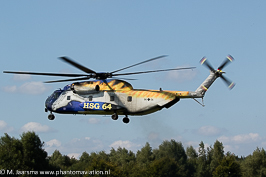 The helicopter improvement project ran from 2006 resultated in the CG-53GA variant. 40 CH-53G/CH-53GS have been upgraded, primarily to avionics, communications, electronic warfare systems and an integrated FLIR sensor turrent. The airframe has been refurbished with an internal fuel tank installed extending the range to 1.200 km. The Israeli Air Force / Defence Force (IDF/AF) purchased 35 helicopters which were designated S-65C-3. Furthermore two aircraft were bought from Austria (two) and from the United States. Upgraded helicopters received tge designation Yas'ur 2000 and Yas'ur 2025. Purchased 11 MH-53Es (S-80M1) of which one crashed and the remaining 10 have all been withdrawn from use. USAF: upgraded its HH-53B/Cs to MH-53J and subsequently MH-53M. German Air Force CH-53G. German Air Force CH-53GA. German Air Force CH-53GA.